Here is a quick survey of what I saw in Excel 2007, concentrating on the file format support, my particular area of interest. The first choice saves in the default format. This is configurable under “Excel Options”, but by default this saves in the new Office Open XML (OOXML) format, with an “xlsx” file extension. The “Excel Binary Workbook” option caught me by surprise. This is not the legacy binary formats. This is not the new OOXML. This is a new binary format, with an “xlsb” extension. Similar to OOXML it has a Zip container file (the so-called Open Packaging Conventions container file format), but the payload consists (aside from a manifest) entirely binary files. I can’t tell if they are some proprietary binary mapping of the OOXML XML, or whether this is an entirely new binary format unrelated to the XML format. In any case this format is entirely undocumented and is unreadable to anyone by Microsoft. 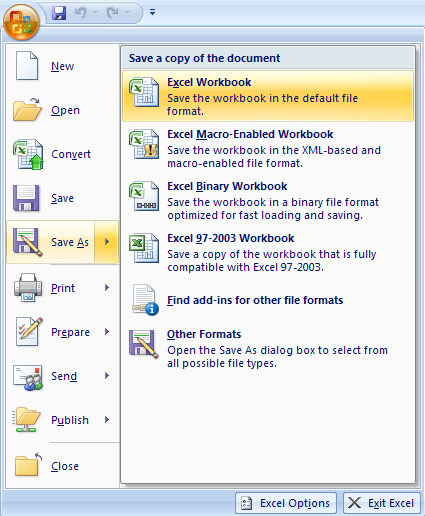 In addition to the new XML-based file formats, Office Excel 2007 also introduces a binary version of the segmented compressed file format for large or complex workbooks. This file format, the Office Excel 2007 Binary (or BIFF12) file format (.xls), can be used for optimal performance and backward compatibility. The Excel 97-2003 option provides the legacy binary “xls” formats, the familiar BIFF format from earlier versions of Office. This takes you to a page where you can download the “Microsoft Save as PDF or XPS” Add-in. Note that you are prompted to download an Add-in that provides support for both PDF and XPS. But if you hunt around a bit you can find another page where you can download just one format or the other, which is what I did, installing just the PDF support. This added a new option, “PDF” to the Save As dialog. My overall impression was soured a bit by the large number of crashes I experienced. Indeed Excel crashed on exit on almost every session. This was dozens of crashes over the course of an afternoon. This will need to be fixed before I would trust it with my data. My examination also put to rest any lingering hope I had that Microsoft had fundamentally changed their position on proprietary file formats and has decided to follow in the paths of openness. The new proprietary binary format and the undocumented ways that macros are encoded put any hope of that to rest. 1/22/07, A quick update: Microsoft’s Doug Mahugh helped track down and fix the crash problem I had earlier reported when exiting Excel. This is a bug in the”Send to Bluetooth” COM Add-in that Excel was loading at startup. After disabling that Add-in, I’m no longer crashing. Needless to say, this article has not received much praise from MS. Interesting, since they are usually quick to point out any effort in their direction. It’s not one-to-one mapping. The binary format has more information in some places. Conversedly, the XML format has more information such as namespaces in some places too. Nice, but don’t forget that one can download a simple add-in to be able to save Office 2007 files as PDF and XPS files. You’ll find it for free, here. Niklas, That page appears to be the same one I was directed to when I chose the “Find add-ins” option. Stephane Rodriguez post is interesting. XML, broadly speaking, is a way to encapsulate instructions. The purpose of XML is to make these instructions “human readable”. So why do I have to write a program to decipher the VB Macro or other data? If the VBA macro and other binary parts are not disclosed, how is another vendor going to reproduce the document? We are not talking here about application-specific stuff that is naturally not expected to be carried from one application to another, such as the location of menu bars etc. We are talking about functionalities that users expects to be reproduced by another application. Please note that I am not against embedding binary data in the zip pocket. It will be horrendously ugly if jpeg file is not binary data. This is embedding binary “instructions” which users expects to be portable across different applications inside the zip file. This example, if anything, serves to show why proprietary extensions should not be allowed in file formats. Did you test MS office 2007 on Vista or on XP. I found the the XP version to crash on some installations regularly as well but on others installtions to function fine. On Vista I have not encoutered a crash (yet). I would certainly stay away from using MS office 2007 in a proffesional environment for at least 6 months but at home or in a test environment it seems very useable. A bit anoying that the PDF add-in is not added by default. Adobe seems to be very weird about their ‘Open’ format. I definitly would prefer that Microsoft add unprotected macro’s as XML parts and only add protected/runtime macro’s as encrypted XML or as binary. 1. Excel VBA macros have no other use except in Excel. They are not interoperable with other software, and thus they do not need an open standard. Toyota engine modifications do not work on Fords, and Apple executables do not run on Windows. Making Excel VBA work on other spreadsheets would mean either mean changing how the latter work internally (functions, hooks, etc.) or an creating an interpreter from scratch (which is such a huge task that MS is not doing it for Mac Office.) Given that, why do we need an open VBA format? 2. The binary format is not Excel’s new default format. Other programs do not need to support it: it is not a document exchange format. It is an internal format for the few cases where XML does not suffice for performance reasons. Most databases, including FOSS ones, use proprietary internal formats for exactly the same reason. They also provide document interchange (export) formats. Excel is doing nothing differently here. This is not entirely true in fact. First, Excel 97 is BIFF8 ; Excel 2000 is BIFF8 + a number of records ; Excel XP is BIFF8 + another number of records ; Excel 2003 is BIFF8 + yet another number of records + new OLE streams (XML data maps). Well, Excel 97-2003 is actually BIFF8 + yet (again) another number of records + new OLE streams (XML data maps). The difference with Excel 2003 is that it stores BIFF12 records as new BIFF8 records, in strategic places. Yoon Kit, who at Microsoft has said that ODF would “confuse the market” because it is another file format to deal with? That doesn’t make sense, since ODF was around before Open XML, and everyone at Microsoft has been consistent in saying that choice is a good thing. As for the XLSB format, it’s simply an option for users who have huge complex spreadsheets and are willing to forego standards in the name of performance. The kinds of spreadsheets that XLSB is used for are not viable in either Open XML or ODF, and those users have decided that they’d rather optimize performance than use an open standard format. Again, the user gets to choose, and the default format of Open XML is always there for Office users. Rob, not sure what to say about Excel crashing dozens of times for you. I’m running it on Vista with no problems, and I’ve not heard that feedback before. What’s something specific that causes a crash? Do you get an error message? Hal, This was Office 2007 running on Windows XP. My laptop is a almost a year old now, so it is not powerful enough to run Vista. Previously I had Office 2003 and did not get this crash. Anonymous, Your logic is circular and can be summarized as, “No one else can read Excel macros, thus there is no reason to document how to do so”. But I can imagine a good number of reasons why someone would want this capability. Considering the virus vector provided by scripts in Office documents, I could see a security company might want to sell a product that scanned incoming Office documents at the gateway and identified potentially malicious macros based on what API’s they call. You could define sandboxes and perhaps only let in documents with macros that limited themselves to a specific subset of API calls. One could also imagine a company offering a service where documents could be uploaded and scripts inserted or updated to accomplish a particular task. There are plenty of innovative things that could be done in this area, but by having a proprietary binary format for the scripts, Microsoft locks everyone else out. This is unfortunate considering the code was entered by the user as plain text to start with. The message is “Microsoft Office Excel has encountered a problem and needs to close. We are sorry for the inconvenience”. I’ve been sending in the automated error reports when this happens. I just did another so you can see what I’m talking about. Doug, in the Malaysian context, it was the Business Partners who raised this issue. is an example of the “doesnt make sense” concerns amongst others. This save as menu is interesting for what it means to governements and other organisations that want to implement a policy of always using a ISO standard document format for corporate records. The user interface makes it both easy and attractive to choose among two or three formats (including the old binary format) that are not standard at all. This user interface is close to be a worst case scenario for implementing such standard format policies because its makes impossible to obtain even a reasonable degree of user compliance. Almost everybody in a business knows Excel, or sits next to someone who does. Compare that to how many people know SQL or MSAccess or any database. If you want people to get work done as easily as possible, to be as productive as possible, you might as well give them the data in Excel. The problem is to get, say, 145meg+ of data, into an Excel spreadsheet as fast as possible. XML is just too slow, way too verbose. Almost 1.5 gig for for xlm is Unusable. 207 meg is not. What I need is the fastest way to get 145 meg into an Excel spreadsheet. Fastest being defined as Open (or import into) in Excel, save in Excel format, close. What is the fastest way to get data into Excel ? The fastest way to load a large data file depends on the access patterns of the application, reads versus writes, sequential versus random access, etc. In some cases the fastest way is to use memory mapped files and just use the Windows memory manager to page in what you need when you need it. I’ve done that before with some success. Of course, interoperability, both with other applications as well as future and past versions of your own application, suffers when you map the format too closely to the application’s internals. The bigger question is this: What has the industry failed to do, that end-users think 200MB spreadsheets are preferable to databases? Have we failed to make databases easy enough to use? Is this a matter of users not wanting to explicitly model data up front? I get exactly the same crash-on-exit problem with Excel 2007. I’m running WindowsXP Pro SP-2 on a ThinkPad x-31. My Excel install is upgraded from Office XP. I have Excel 2007 on two other systems, also upgraded from OfficeXP and also on WidowsXP SP2 and Excel works flawlessly. So who knows… But you’re not the only one getting this annoying crash. I am becoming very nervous about Excel 2007’s own formats and although I work in Excel 2007 I work in compatibility mode, saving as an Excel 93-2007 workbook. I believe I found a bug where if the compatibility checker finds a 2007 specific feature, then thereafter some analysis toolpak functions like EOMONTH get trashed as !#VALUE errors if saved as a 97-2003 workbook. I can’t be sure of the exact cause, but it means that operating interchangeably in both file modes feels precarious. Rob, i have exactly the same crash. But unfortunately i cannot remove bluetooth add ins. Excel report that the add in state in H Local Machine cannot be changed. That seems to work for solving the problem. Hope it will work for you to. I have the same crash problem with excel 2007 running on XP, the problem may not be linked to Btsendto_office.dll as this dll is not present on my system. If someone Knows how to fix the problem XP environment, I would be very pleased to know about it. Office 2007 .bin file format by Stephane Rodriguez. Did you try to create an CSV with the 2007 version? I need the format of the old version when I need to upload to an AS/400 file, this is the way the programm as been created but MS change it… So nothing works anymore! Not sure what the car example has to do with open source or with monopolies. Microsoft is a closed source based monopolist. I also consider open source to be a part of the context for discussion. Simply, the car companies are not monopolies. If they were though (forgetting for a minute that they would be regulated much more), how would you describe open source for cars unless there was a manufacturer that opened up all the designs and chips used in the car (boiling them down to cots components). So the car industry neither has open source nor monopolies. Your example was horrible. Anyway, the “solution” is simple: provide the source for macros (and compile that after they are loaded) or at least some sort of byte codes. OR, define the binary specs and then other products can build a compatibility layer of some sort. Of course, this would STILL BE A GAME. Microsoft has every business incentive to extend the standard in a closed fashion. Practicality dictates they would do that anyway as long as they control the apps and the OS and insist on integration as a way to define the value of their products. This would happen no matter what protocol/spec is defined. The way out is not to rely on a closed source monopolist as your vendor. >> Most databases, including FOSS ones, use proprietary internal formats for exactly the same reason. They also provide document interchange (export) formats. Excel is doing nothing differently here. FOSS databases are open source. This means the “internal formats” are defined openly (if a bit implicitly). Also, since when are macros something that should not be interchanged across products? To say they are not means that part of the document format is closed. No part of a format is closed when we use FOSS. No part need be closed when we use closed apps but inevitably this will happen, all the more so when the vendor is a monopolist since their position is strengthened when they actually violate the standard. In short, FOSS is the way to make sure that everything is open and can be reproduced in other apps. Also, in theory, internal formats can be specified for closed source apps, too. That this would interfere with the obscurity cloud behind which closed source vendors want to hide in the first place is another story. I just installed excel 2007 and when I open an old file (created on excel 2000 I guess), Excel show the message “Line Print Settings” as an incompatible resource if I try to save in the new 2007 format (.XLSX). But it saves the file, ok. The true problem happens when I try to save this file back as a excel97-2003 file (.XLS), Excel will simply close and refuse to save the file. If I try to run “prepare – check for compatibility problems” excel will close suddenly too. I am simply unable to recover a file converted to the new format. I guess this could be a potential problem to much people. I had a similar problem with an old worksheet. I was crashing a lot when editing it. I did a save as, and chose the new Office 07 format. It would throw an error trying to save that, stating there were problems with the Line print settings. My final fix was to open the document in Office 2003. thejn I saved it as an Excel 4.0 WORKBOOK. Workbook being bold because the first option is worksheet, which didn't work. Once it was in Excel 4 format I was able to open that with Office 2007, which promptly told me that the document was unreadable, but that it would try to recover the document, at which point it would ask me where to save the new one. That resulted in a readable document that could be edited and saved without error. The only real problem with the resulting document was external links were severed, and charts were no longer correctly sized. Beats entering them all again. My $0.02 on 07 is that is is a nice new interface that takes a lot of getting used to after using the old interface for roughly 15 years. Considering that there's practically no new functionality for the average user, it is pretty unacceptable that this wasn't implemented as a skin that could be turned on or off at will. Just ran into this “line print settings” problem today. Saving an old (probably Excel 2000) worksheet to Excel 2007 format. In my case I don’t have any macros or VB code at all, so I have no clue where Excel thinks these “line print settings” are stored. In any event, I saved the worksheet first as Excel 2003 XML format, which “leaves out all incompatible settings”. Then, opened the XML worksheet and saved as Excel 2007 workbook format. The sheet works fine and gives no error. Hope this alternate approach might be of help to someone. I use an app called VbaDiff that seems to read the VB code right out of the workbook, so perhaps there’s hope still in that regard.